Constructed: between 42 and 29 B.C. The temple was initially conceived of as a heroon for the murdered C. Iulius Caesar. During the extension of the Forum under Augustus, the temple developed more and more into the primary structure for the self-representation of the new Julian dynasty and the first Emperor of Rome. The temple was built in the wake of the cremation of Caesar’s corpse, a few days after his murder on the 15th March 44 B.C. (Ides of March). 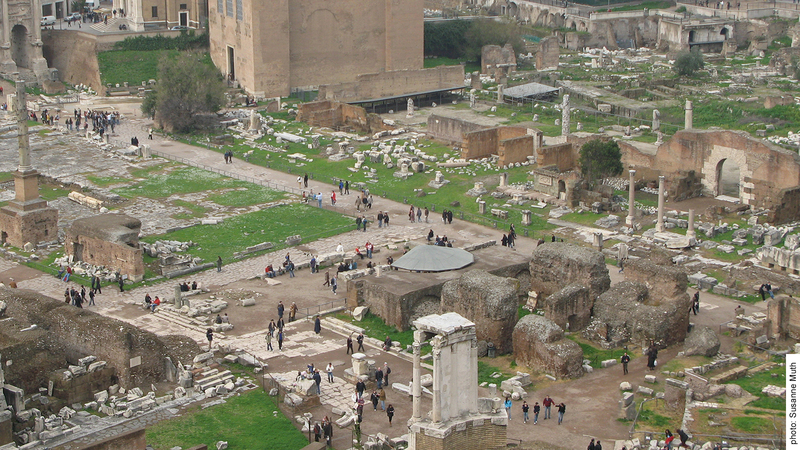 Following Marc Antony’s funeral speech on the Forum, the distraught populus spontaneously decided to burn Caesar’s body on the east side of the Forum in front of the Regia. Shortly afterwards, Caesar’s supporters erected an altar and a column there, intending it to become a site for the ritual worship of Caesar. This cult site quickly developed into a political issue: the people who had wanted Caesar’s death – among them Dolabella, the new consul in 44 B.C. – tore down the altar and column shortly thereafter. The populus as well as Caesar’s veterans demanded that the cult site be rebuilt. The triumvirs Marc Anthony, Octavian (later Augustus) and Lepidius, who saw themselves as the political heirs to Caesar’s empire, were keen to support this cause. In 42 B.C. 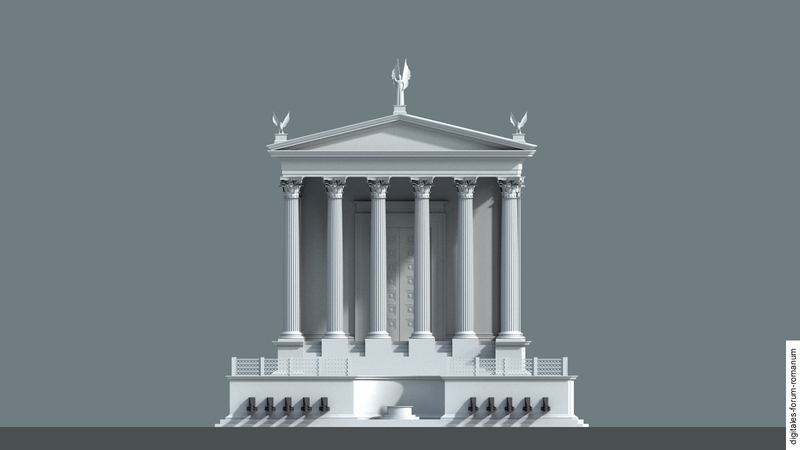 Caesar was deified by the Senate and it was decided that a temple would be built on the location of the altar. The temple was completed and inaugurated many years later, after Octavian had prevailed over Marcy Antony and Cleopatra at Actium in 31 B.C. and secured his place as sole ruler. The temple was inaugurated directly after his triple triumph, on August 18th 29 B.C. 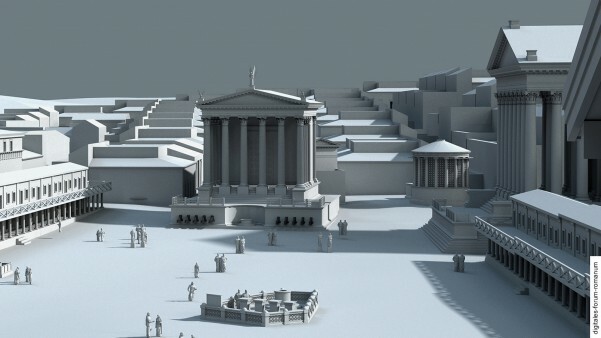 The towering temple occupied the middle part of the eastern edge of the Forum and formed its new eastern boundary. 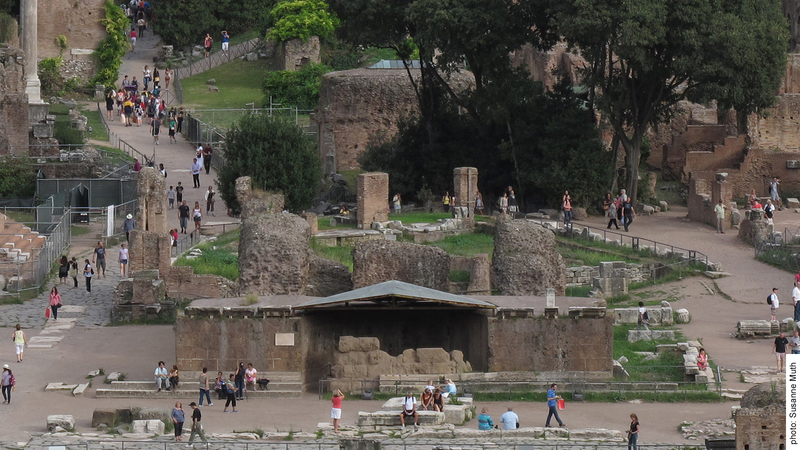 At the time of its inauguration, the temple’s earlier significance for Augustus (Octavian’s new name as of 27 B.C.) was strongly diminished. At the start of Octavian’s political career, when he was still standing in Marc Antony’s shadow, it was immensely important for his later success that he associate himself with his deified adoptive father Caesar and portray himself as Caesar’s legitimate successor and son (divus filius). 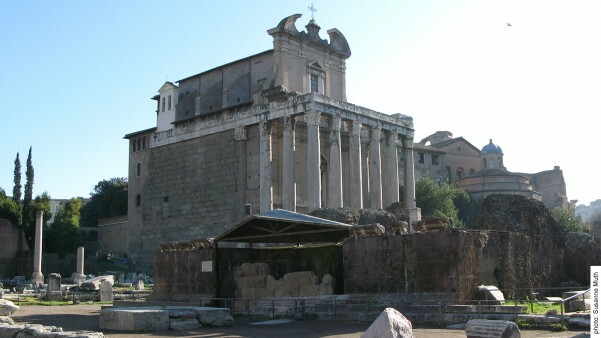 Within this context, the purpose of the temple of the divus Iulius on the Forum was to send a striking visual message to ground his claim to power. However, after Octavian had established his sole rule through his victory at Actium, it became increasingly less important to associate himself with Caesar and increasingly more important to showcase his own military victories. Accordingly, the temple’s purpose changed after its inauguration: Augustus ordered that some of the spoils from his victories be consecrated in the temple and thereby transformed the structure into a monument of his own personal victory. An especially prominent role was assigned to the prows of the ships defeated at Actium, now displayed on the front of the base of the podium. This arrangement mirrored the appearance of the Rostra Augusti at the west side of the Forum: just as the naval rams on the Rostra Augusti symbolised the victory at Antium in the middle of the 4th century B.C., the rams at the Temple of Caesar symbolised Augustus’ latest victory – which thereby joined the ranks of other outstanding victories for Rome. From that time on, the temple’s function was ambiguous. On the one hand, it served as the cult site for worshipping the deified Caesar; on the other, it was a monument to a military victory of the new Princeps Augustus, and perpetuated his political claim to power on the Forum. A speaker’s platform was erected in front of the temple, from which the people were addressed on a variety of different occasions. Thus the structure evolved into the counterpart of the Rostra Augusti, the “real” speaker’s platform, which was located on the west side of the Forum. 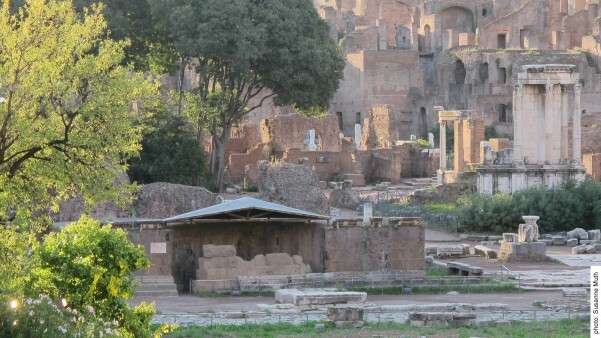 The fact that the temple was used as an alternative place to give public speeches underlines that the new ruling dynasty of the Iulii lay claim to the Forum as a space of political representation. The extravagant architectural construction of the temple supported the political and representational message that the structure was intended to send. Admittedly the temple was only moderate in size; this was due to the relatively small area on which it was built, the only available area located at the east side of the Forum at the time. However, the temple was successfully elevated through a two-storey podium substructure. Six columns decorated the front of the temple. The narrow placement of the columns contributed to the overall impression of a towering structure. The temple was lavishly embellished with marble. Stairs on the long sides led up to the first level of the podium, whence further stairs (situated in the middle) led up to the actual temple. 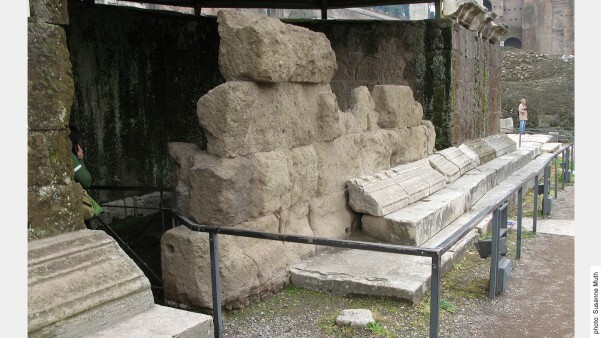 On the front side of the lower podium was a semicircular niche containing the old altar of the former cult site from 44 B.C. It is telling that the niche was blocked off at a later time (probably during Augustus’ reign) and the altar was relocated to the podium (for the individual phases, see below). Only very little of the magnificent architecture of the temple has survived. The most important extant feature is a tripartite core from the base of the structure, composed of opus caementicium. The upper architecture has been lost in its entirety, with the exception of a small number of fragments from the marble facing. 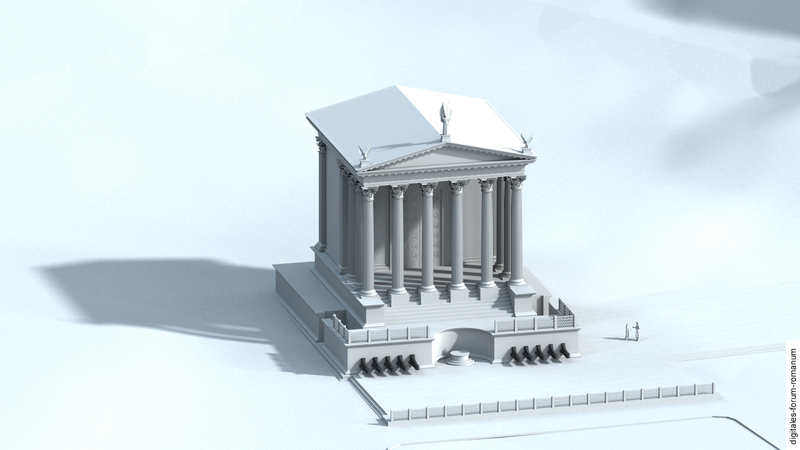 Because the negative image of the caementicium core reveals the configuration of the supporting walls, the appearance of the temple can be reconstructed to a large extent – based also on the architectural fragments and literary sources (for images of the present-day ruin, see below). 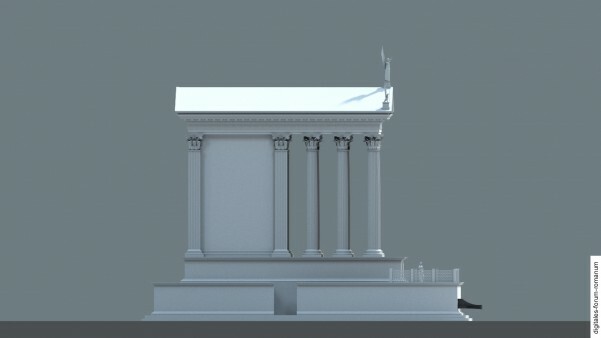 The temple inaugurated in 29 B.C. must have been a prostyle temple with a podium, built upon a further podium substructure. Six closely spaced columns (probably Corinthian) stood at the front, while two further columns were situated on the sides. Because there was not enough space for a set of steps leading up to the temple’s front hall, the upper stairs were carved into the spaces between the columns (intercolumniations). Due to the fact that there was only a small area available for the cella, located at the back of the temple, the cella’s walls were erected so far towards the sides that they coincided with the outer boundary of the temple’s podium (= prostyle temple). Pilasters were erected in front of the corners of the cella’s walls in order to mask them. 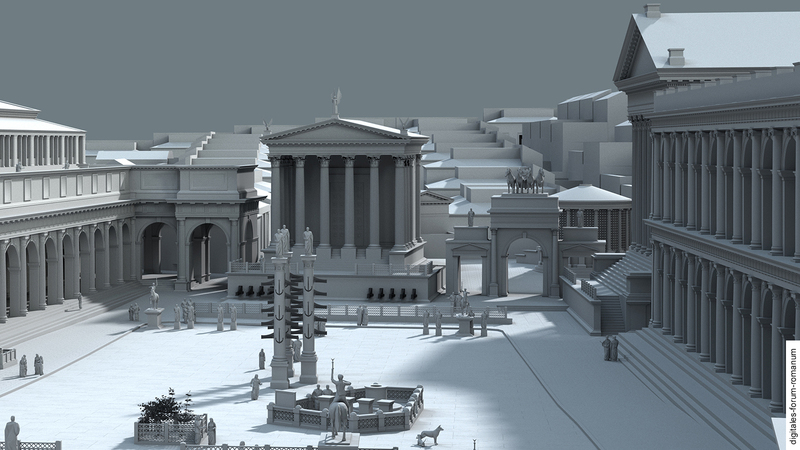 The lower podium also served as a platform and protruded beyond the area of the actual temple on the north, west and south sides. Presumably this platform was accessed via stairs located on the long sides of the temple. The front side of the platform was decorated with the naval rams from Actium. 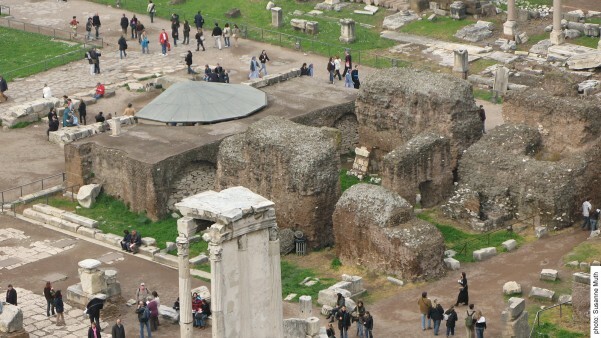 There was a half-round niche situated in the middle, where the altar from the former cult site of 44 B.C. stood. 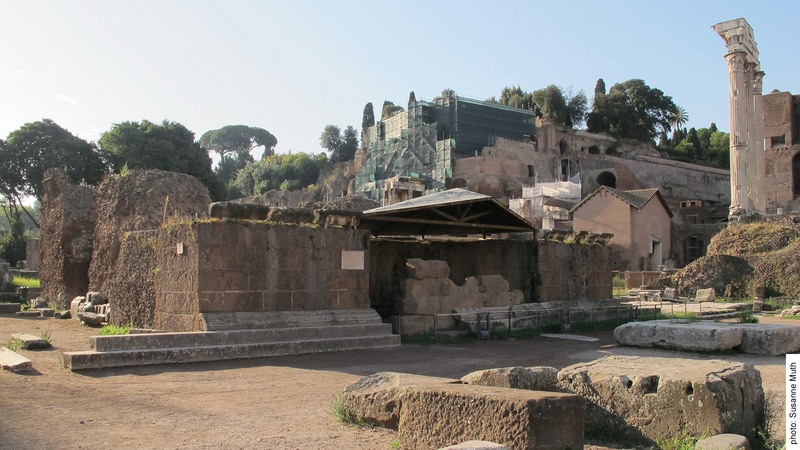 Because this platform was used as a speaker’s platform, is is plausible to reconstruct a balustrade (probably made of wood) to either side of the front of the platform, just as for other rostra (such as the Rostra Augusti). 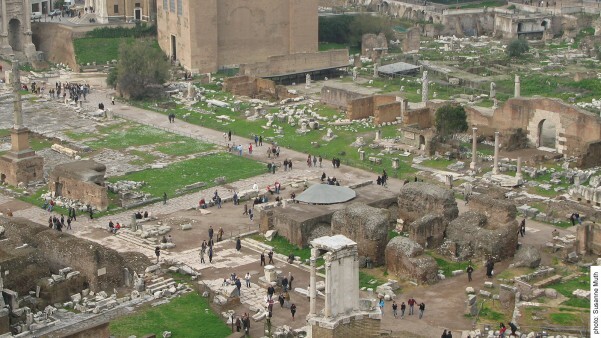 While the Temple of Caesar initially stood at the east side of the Forum, free from surrounding buildings, the later construction of additional buildings such as the Parthian Arch to the south and the Basilica Paulli to the north caused the Temple of Caesar to be more closely enveloped by the surrounding architecture. This also affected the positioning of the steps, which had already been unusually arranged within the original plan due to the speaker’s platform in front of the temple prohibiting steps up the front (the normal configuration). During the first phase, the way up to the side stairs (in their probable loaction, compared with the common size of the steps from this time period) collided with the two arch structures moved nearer the long sides of the temple on the north and south. 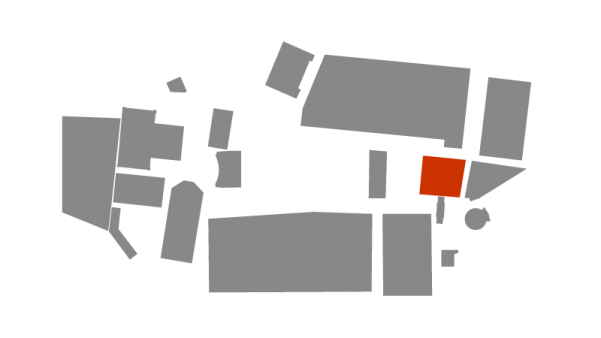 Thus it is possible that the access point to the temple was changed shortly after the temple was built. In our reconstruction we suggest that the corridor leading to the stairs should be extended eastwards. This shifts the entrance to a location east of the Parthian Arch and the arch structure at the Basilica Paulli. Because these buildings are dated to the middle or late period of Augustus’ rule, this supposed alteration would also fall into this time period. The dating of a second alteration which profoundly changed the appearance of the Temple of Caesar is far less clear. The semicircular niche in the middle of the front of the platform was bricked up with tuff blocks, and the altar was probably relocated to the podium (in order to preserve the sacred rites). No naval rams were displayed in this newly bricked up area. The exact dating of this alteration is subject to debate within the scholarship. It is generally assumed that the reason for this alteration was a desire to gain distance from Caesar and his cult. A number of historical circumstances could have caused such a desire for dissociation. Several scholars have suggested that the niche was bricked up in Later Antiquity, in the course of Christianisation and the abandonment of pagan cults. Other scholars have suggested that the alteration was made during the later Augustan period, once the new ruler no longer needed the legitimisation through his deified adoptive father as an ideological message within his self-presentation. In contrast to these explanations we want to put forward a much more pragmatic solution: the fact that the middle section of the lower podium incorporates a niche for the altar hindered its general use as a speaker’s platform because the niche occupied the exact place where the speaker would stand. Once the niche was closed up, it was possible to push forward the platform area at the middle section and thereby optimise its uses as a Rostrum. This may have been the real reason for the alteration.